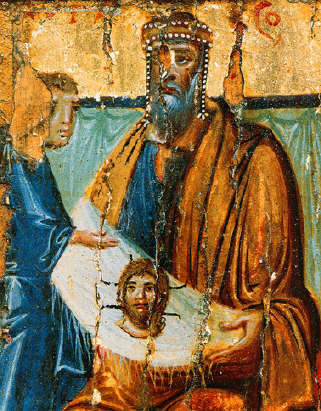 Image: Icon of King Abgar, tenth century, St. Catherine's Monastery, Mt. Sinai. Abgar is depicted holding the "Mandylion" or "Image of Edessa," a piece of cloth upon which supposedly the face of Christ appeared. I have another installment to the series on Eusebius of Caesarea’s The Ecclesiastical History: Book 1, chapter 13: Listen here. Eusebius claims to have taken this information from Syriac documents taken from the archives of Edessa. They include a letter sent by Abgar to Jesus asking him for healing, through the courier Ananias and a reply letter from Jesus by the same courier in which he promised to send to Abgar one of his disciples after he is “taken up.” This material is clearly legendary, though Eusebius accepts it as authentic. If authentic it would be the only extant written material from Jesus. It also includes a report that after Christ’s ascension, Judas/Thomas sent Thaddaeus to Abgar. Thaddaeus heals Abgar and other of this subjects and preaches to them. The report ends by saying this happened in the 340th year. A note from Lake explains this means the 340th year of the Edessene era, which began in 310 BC, and which would date Thaddaeus’s mission as taking place in AD 30.